A cashless society might sound like something out of science fiction, but we’re already on our way. Several powerful forces are behind the move to a cash-free world, including governments and large financial services companies. Even critics of the mainstream financial system and government-issued currencies favor doing away with cash. But we’re not there yet. In addition to logistical challenges, we need to address several social issues before giving up on cash entirely. The benefits and disadvantages below can give you an idea of the myriad of effects going cashless can have on money and banking as you know it. Less crime: With cash, it’s easy to steal money, whether the amount is large or small. Also, illegal transactions (drug trade, for example) typically take place with cash so that there’s no record of the transaction—and so that the seller can be certain about getting paid. Paper trails: Financial crime should also dry up. It is harder to hide income and evade taxes when there’s a record of every payment you receive. Money laundering becomes much harder if the source of funds is always available. No cash management: It costs money to print bills and coins. Businesses need to store the money, get more when they run out, and deposit cash when they have too much on hand. Moving money around and protecting large sums of cash could become a thing of the past. International payments: When you visit a foreign country, you may need to buy local currency. But payments are easy if both nations can handle cashless transactions. Instead of figuring out another currency, your mobile device handles everything for you. Depending on your perspective, going cashless might actually be problematic. Privacy: Electronic payments mean less privacy. You might trust the organizations that handle your data, and you might have nothing to hide, but your payment information could turn up in ways that are impossible to predict. Cash allows you to spend money and receive funds anonymously. Hacking: Hackers are the bank robbers and muggers of the electronic world. In a cashless society, the consequences are higher if somebody drains your account because you don’t have any alternative ways to spend. Even if you’re protected under federal law, you face significant inconveniences and other consequences after a breach. Inequality: The poor and unbanked will have an even harder time in a cashless society. They don’t have expensive devices for making payments, and those who operate in the informal economy would have no way to get paid or receive aid. The U.K. is experimenting with contactless ways to donate to charities and homeless individuals, but there’s still a long way to go. Fees, Fees, Fees: If we’re forced to choose from just a few payment methods, can we expect financial institutions to give us a fantastic deal? 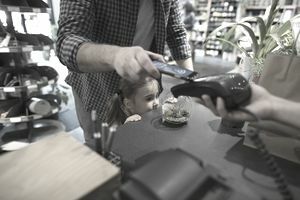 Payment processors may just cash in on the high volumes, eliminating the savings that should come from less cash handling. Overspending: When you spend with cash, you feel the “pain” of every dollar you spend. But with electronic payments, it’s easy to swipe, tap, or click without noticing how much you spend. Consumers will need to renew their efforts to manage spending. Negative interest rates: When all money is electronic, if the government charges banks a negative interest rate, they can pass it on to customers (in the form of fees) who will no longer have any cash to pull out and stuff into a proverbial mattress to avoid the negative rates. Dropping the interest rate is typically a move to stimulate an economy, but the result is that money loses purchasing power. What Does a Zero-Cash World Look Like? Without cash, payments happen electronically. Instead of using paper and coins to exchange value, you authorize a transfer of funds to another person or business. The logistics are still developing, but we have some hints on how a cashless society might evolve. Credit cards and debit cards are among the most popular cash alternatives in use today. But cards alone aren’t enough. Mobile devices will most likely become a primary tool for payments. Electronic payment apps, like Zelle, PayPal, and Venmo, are helpful for P2P payments. Mobile payment services and mobile wallets like Apple Pay provide secure, cash-free payments. In developing and developed nations that use cash sparingly, mobile devices are the most common tools for payments. Cryptocurrencies are also part of the discussion: They’re already used for money transfers, and they introduce competition and innovation that may help keep costs low. But they currently have risks and regulatory hurdles that make them impractical for most consumers, so they might not be right for widespread use. Several nations are already making moves to eliminate cash, with the push coming from both consumers and government bodies. Sweden and India are two notable examples. Sweden: It’s not uncommon to see signs that say “No cash accepted” in Swedish shops, and some banks no longer handle cash. Cash payments are only 15 percent of retail sales in Sweden, and some point to Sweden as the model for a modern cashless society. Consumers are mostly happy with this situation, but the poor and elderly still struggle with an electronic world. India: The Indian government banned 500 and 1,000 rupee notes in November of 2016 in an effort to penalize criminals and those working in the informal economy. The implementation was rushed and controversial, and roughly 99 percent of those banknotes were deposited—meaning criminals didn’t lose much, if any, money. Electronic transactions increased temporarily, but fell to pre-demonetization levels in the next year. Those examples suggest that going cashless is possible with sufficient infrastructure and gradual progress. The remaining questions center on how the marginalized will fare when cash is history. What is Popmoney? Is it Legit?